The barn operates all year long and serves as a warming hut, tennis pavilion and just plain old “cabin-in-the-woods” for children’s sleepovers. Designed in the tradition of vernacular New England timber-fame barns, the barn exterior has stained vertical cedar barn siding, cedar and lead coated copper roofs, and fieldstone chimney. 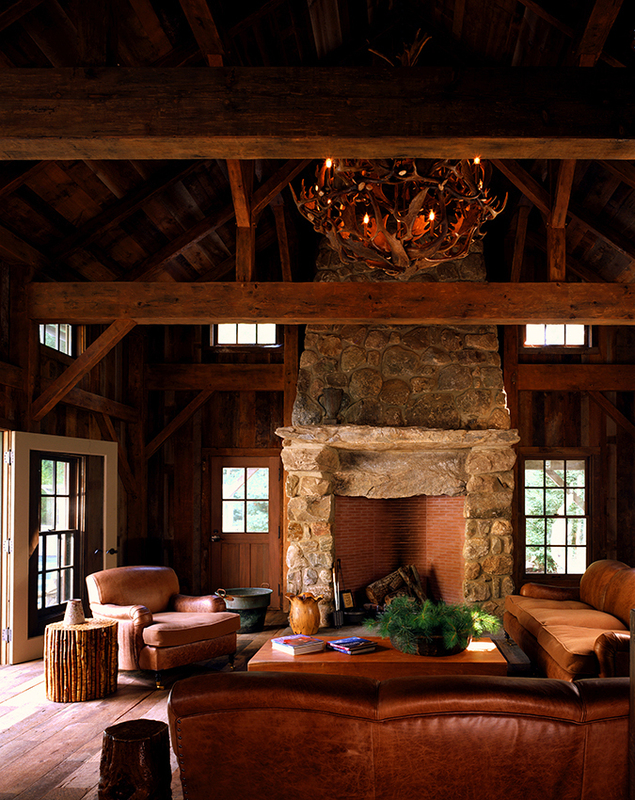 The interior is constructed around a new distressed Douglas Fir timber structure, with reclaimed barn siding for interior walls and ceiling, reclaimed oak plank flooring, and a monumental “walk-in” fieldstone fireplace. Industrial lights with exposed metal conduit and simple details all contribute to the straightforward Lodge character. Planned in tandem with the barn, the combo tennis/hockey rink has a refrigeration system buried in the slab to maintain ice from November to March.